I am beyond excited to share this news with you! 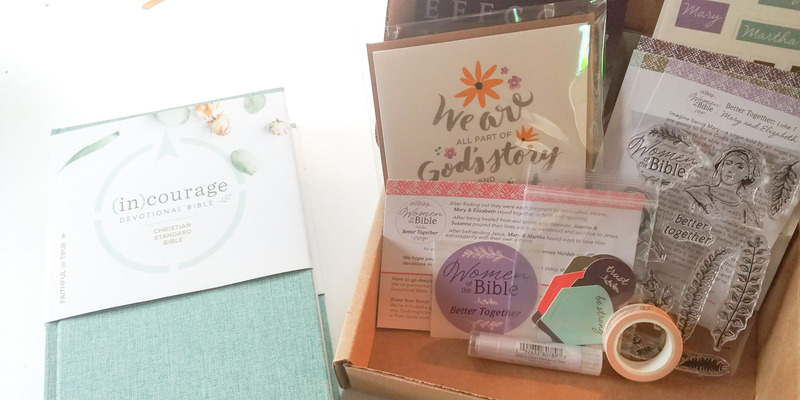 Today is “launch Day” for the new DaySpring Bible Journaling kit, Women Of The Bible: Stronger Together. 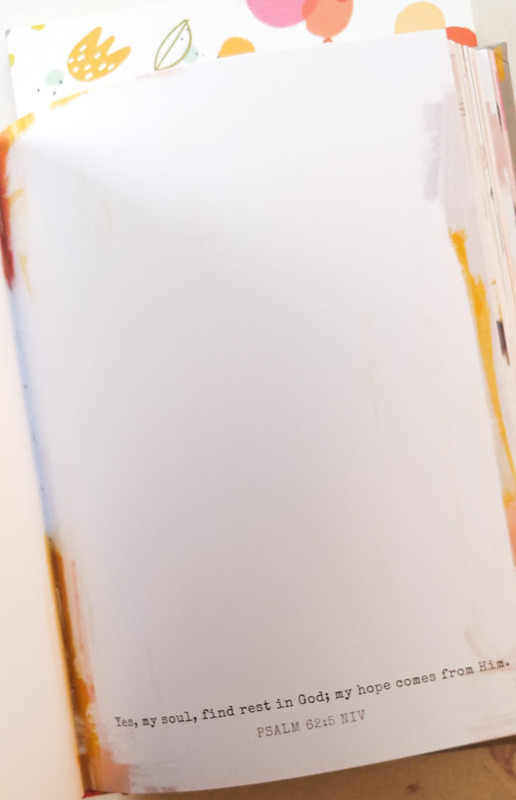 There have been some changes lately in the Bible Journaling world and I am excited to share with you, as well as answer some questions I have been receiving. This kit was sent to me as part of the DaySpring Launch Team, but all opinions are my own. If you have been following me for any amount of time, you may have seen me share about the Illustrated Faith kits. Illustrated Faith has been part of DaySpring for a few years now and it has been a wonderful partnership. Now that their contract is up, Shanna Noel decided to create a website specifically for Illustrated Faith, which is such an exciting thing! The Bible Journaling community is growing by leaps and bounds, and that is such a blessing. So, DaySpring will now have their own monthly Bible Journaling kits as well. 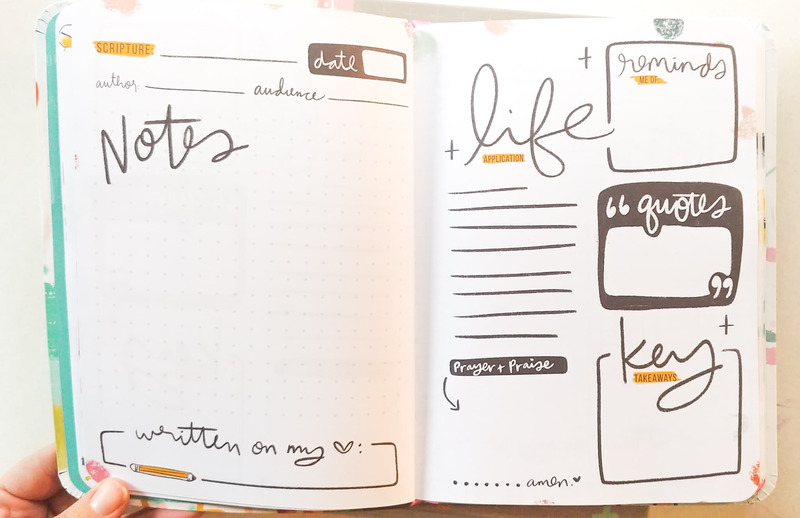 This gives you even more options for your own journaling. You have more choices when it comes to what you want to study, what tools you want to use, your creative tools etc. There is absolutely no bad blood between Illustrated Faith and DaySpring, so let’s just get that out there now. Shanna will still be appearing with DaySpring and partnering on some projects, as you’ll soon see! One other thing that I love about having more kit options is that I can choose how I want to be creative in my Bible. Illustrated Faith definitely showcases Shanna’s style, with bold colors and swatches, and handwritten words. DaySpring’s kits will be a little softer, a little more of a romantic theme. I actually prefer the style of the DaySpring kits, but I will show you and you can decide for yourself! The DaySpring monthly kits will be set up as a series of three kits, focused on one theme. 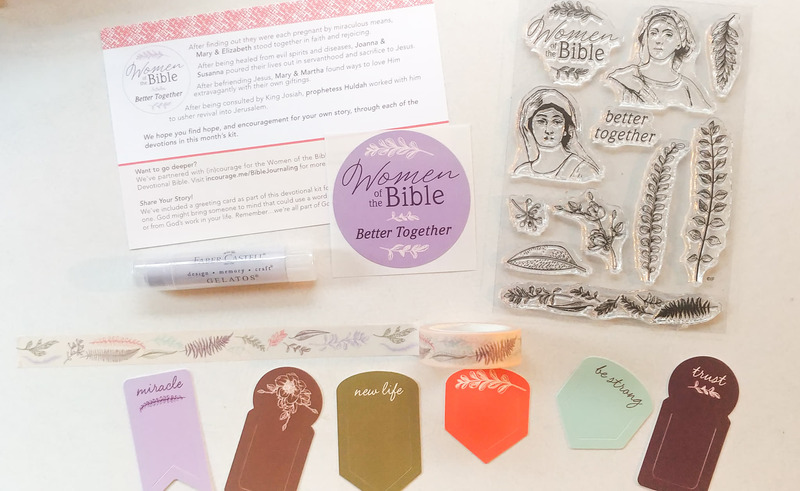 The first series will be called “Women of the Bible” and this month’s kit is titled “Better Together” and is designed by the (in)courage team over at DaySpring. This kit still has a welcome card from DaySpring, telling you about the kit and the contents. You also receive a beautiful card to send to someone in your community, which I love. In today’s world, we don’t offer send cards in the mail anymore. One addition that I love is that we will be receiving some sort of art medium in each kit! 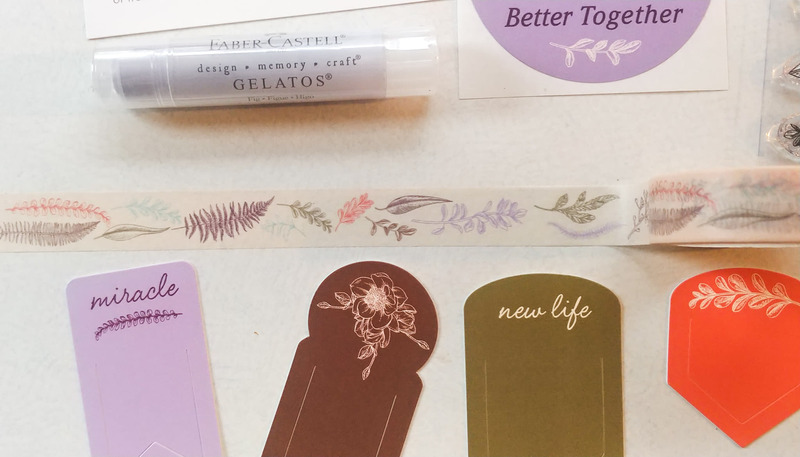 This month, we get a Gelato pigment stick in one of the most popular colors. You will be able to use these with any entry in your Bible since it’s so versatile. We als have a set of shaped tabs to go along with the devotional themes. This month’s kit includes 4 devotional cards with content focusing on several women in the Bible – Huldah, Mary and Martha, Joanna and Susanna, and Mary and Elizabeth. We will be learning about different Women of the Bible with each kit. 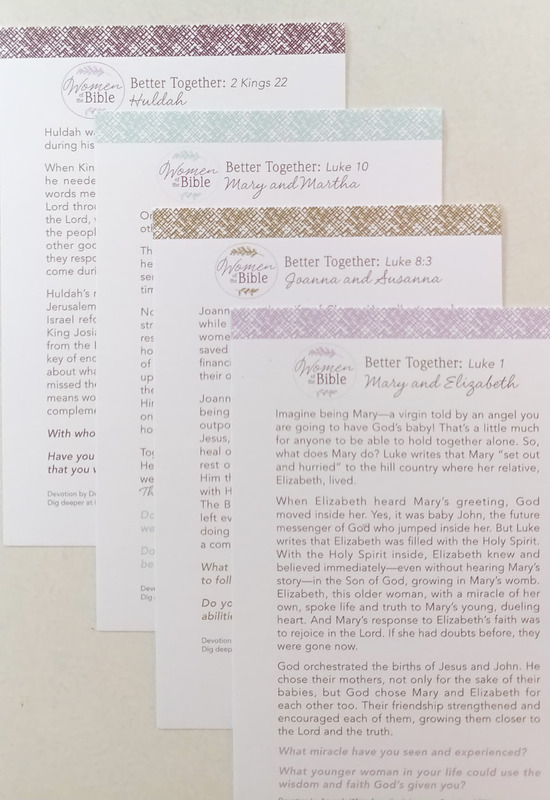 Each card has some journaling prompts to help you connect and reflect on the devotional content and verses. You also get two sheets of alphas stickers and 2 sheets of clear stickers. I love the colors this month! 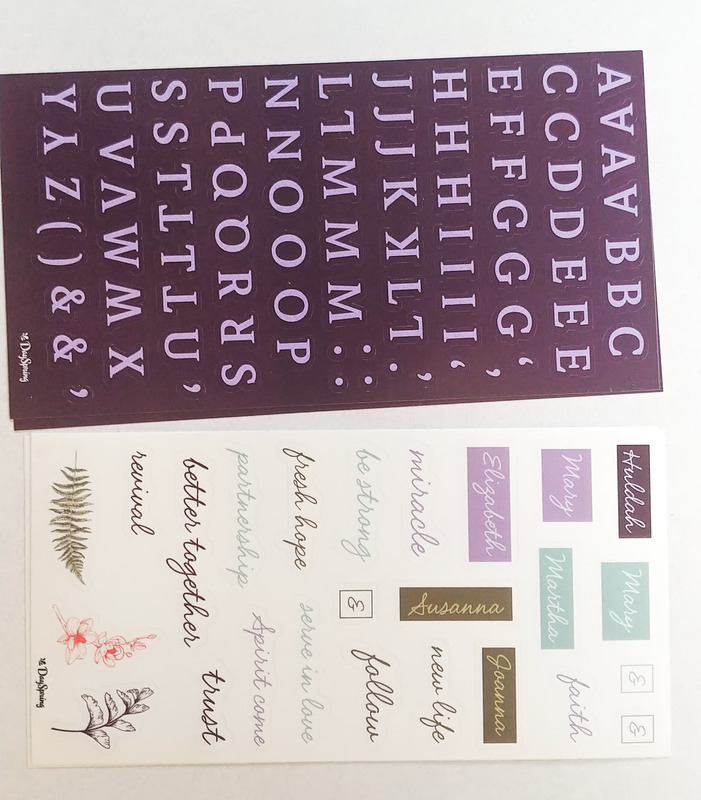 In addition to the physical kit, DaySpring will email you a set of printables, similar to what you see here. I love that they do this, so I don’t have to worry about running out of elements, and can even use leftovers later on. The Women of the Bible series of kits has been designed to work well in the (in)courage Devotional Bible. This Bible i not required to go through the DaySpring kit, but it is wonderful if you have it. If you have another journaling Bible, you can use that. However, there is a Better Together theme in the (in)courage Devotional Bible that is meant to be the perfect addition for this. 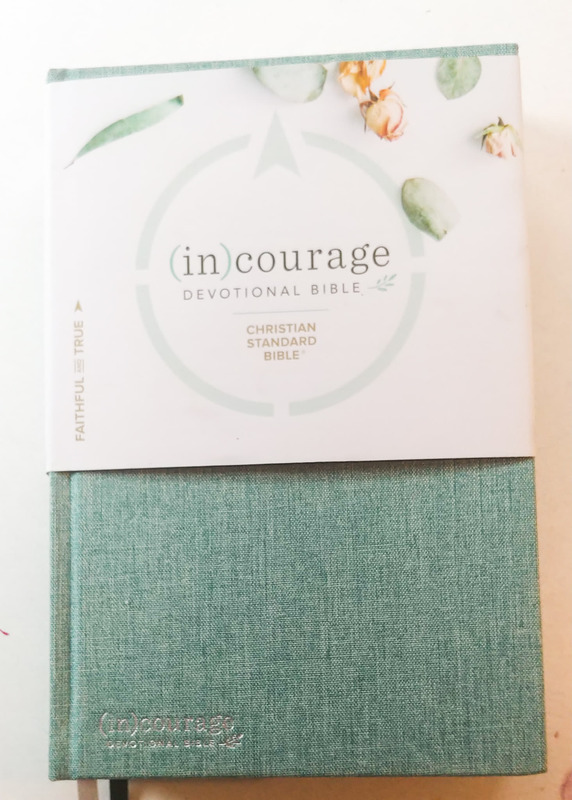 There are ten Devotional themes woven through the (in)courage Bible, with a reading plan to go along with it. You can see below the Better Together them on the left. It directs you to a reading plan and the accompanying devotionals in the Bible. The kits for March and April will also go along with one of these themes, so it may be nice to have this Bible if it fits within your budget! There are even more new products over at DaySpring that you’ll love! 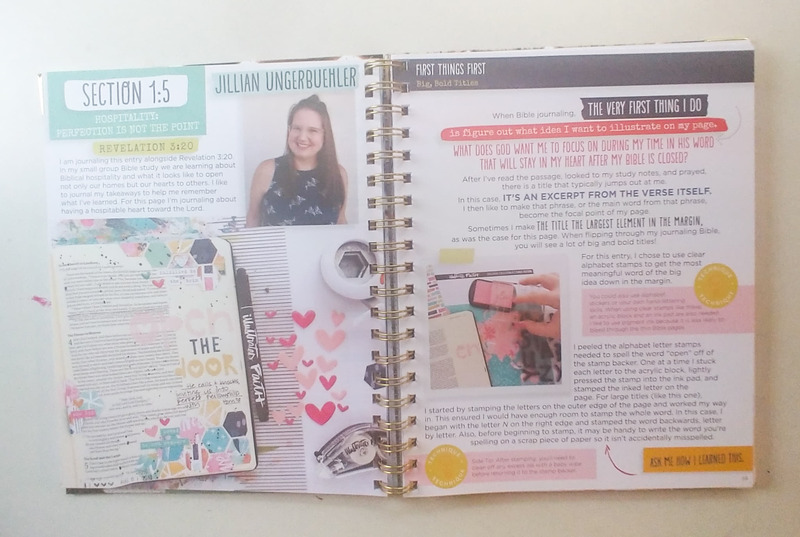 A Workbook Guide to Bible Journaling is in answer to so many of you who just need some direction and inspiration. So much thought and effort went into creating this workbook, and it does not disappoint! 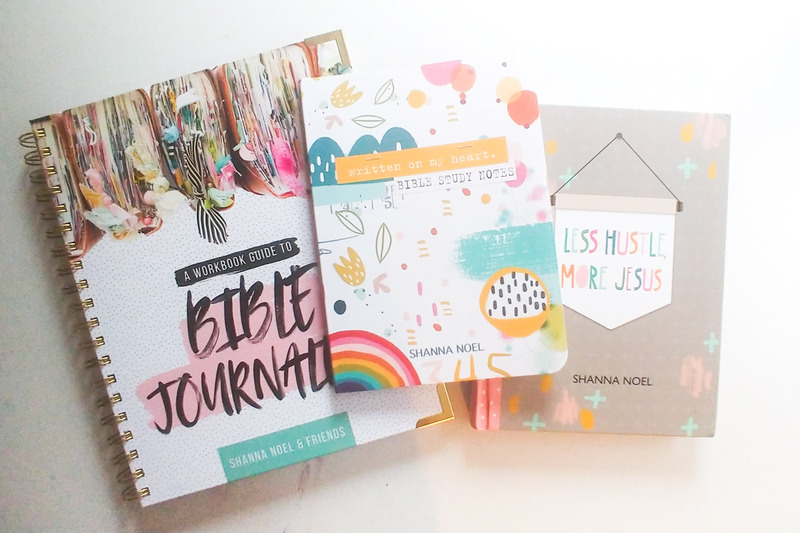 There is also a Bible Study Notebook called Written on my Heart, and Less Hustle, More Jesus, which is a journal with Scripture on each page and lots of room for you to write or be creative. Both of these were created by Shanna Noel, so they have her signature style throughout. 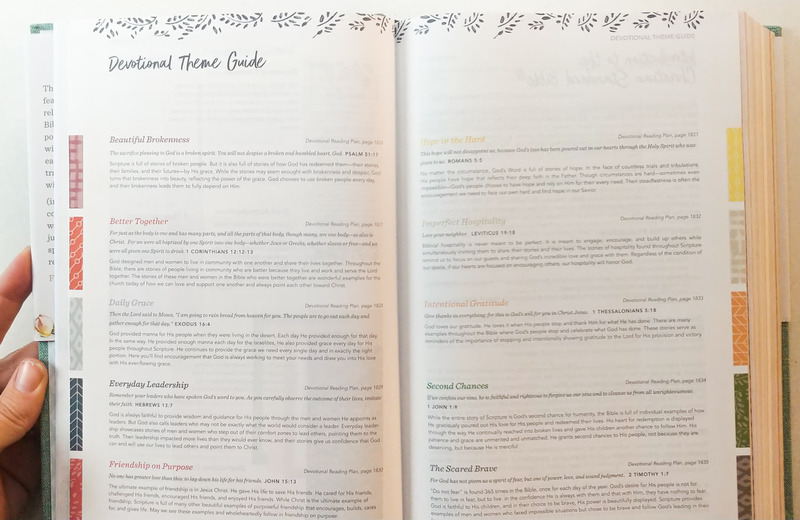 Do you love the new DaySpring Devotional Kit as much as I do? 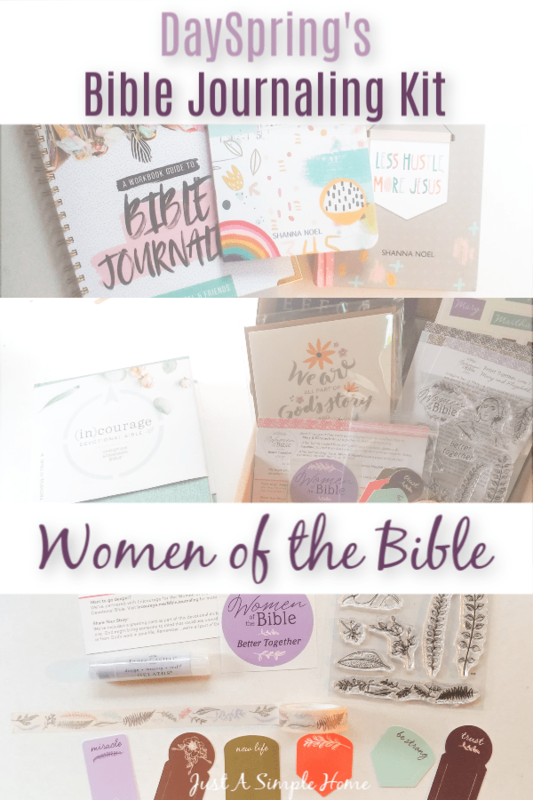 Go run and grab your kit and journal along with us as we learn about the Women of the Bible! If you haven’t joined my Bible Journaling For Moms group, do so! We would love to have you! I love this bible journaling kit and think it would make a great gift for anyone. Starting with myself. I have wanted to start Bible journaling for a few months but it is a bit overwhelming. I hadn’t thought about starting with a kit. I have never even heard of this! Absolutely love the image you showed where you can write in your own stuff. I will check it out! These are so pretty! I started journaling in my Bible about a year ago and usually just rewrite a verse in the margin or something basic like that. I love colorful pens but haven’t gotten into stickers or some of the other cool things available for journaling. These are adorable! I love that the kit has devotionals with it and it clearly designed to journal around those ideas! I have never seen Bible journaling done that way!